So, although color guards perform at football games across the United States, it remains to be an underground form of performance appreciated by an elite audience who understand it better than the rest of us; or, as David Byrne puts it, color guard is “a sophisticated folk art form that flies under the official cultural radar.” A recently converted fan of color guards, Byrne decided to produce an event at Brooklyn’s Barclays Center in the summer of 2015, inviting ten color guard teams and pairing them up with musical artists (David Byrne, Lucius, Nico Muhly & Ira Glass, Nelly Furtado, St. Vincent, Devonté Hynes, How To Dress Well, Zola Jesus, Money Mark + Ad-Rock, and tUnE-yArDs). Sure, color guards already have the annual World Championships that take place in Dayton, OH, but Byrne’s event would not be a competition, it would be a celebration of the art form; plus, the color guard teams would be accompanied by live bands performing songs that were written specifically for their performances. The question remains: would the pairing of hip musical acts with color guards actually make color guards cool? 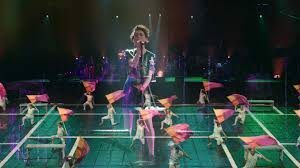 Adding on to my initial confession, I would normally not be interested in a color guard documentary, even if it featured some of my favorite musical artists. Nothing against color guards, it is rare that I enjoy live performance documentaries. There are some exceptions, of course, but it is not a documentary form that generally interests me. However, when I noticed Bill Ross IV and Turner Ross were credited as directors of Contemporary Color, I instantly changed my mind. The Ross Brothers have made two of my favorite documentaries of this decade (Tchoupitoulas and Western), and I am already convinced that they can do no wrong. With the Ross Brothers at the helm, I could be confident that Contemporary Color would not be a typical performance documentary. My confidence increased exponentially when I noticed the names of several of my other favorite documentary filmmakers listed as camera operators — Jarred Alterman (Convento), Robert Greene (Kate Plays Christine), Jessica Oreck (Beetle Queen Conquers Tokyo), and Amanda Rose Wilder (Approaching the Elephant). Something all of these names have in common is their keen ability to passively observe their subjects. They all approach human subjects as if they are filming a wildlife documentary. The thought of them capturing color guards (and their audience) in this manner intrigued me. Let’s just say that the cinematic pedigree of Contemporary Color does not disappoint. The “life caught unawares” perspective is precisely what I would expect from the talent behind the cameras. This is a documentary that attempts to capture how the subjects act, not necessarily in their natural environment, but within the confines of the Barclays Center. The stress and intensity of the event is utterly pervasive. The Ross Brothers capture the pre-performance warmups and jitters, the beautiful chaos of the performances, and the emotional release after the performance ends. Additionally, they intersperse snippets of private conversations from throughout the audience. The footage is assembled in a somewhat off-kilter structure, jumping from live performances to backstage with an editing style that seems to be rooted in chaos theory. The film is kinetic and frantic; there seems to be no way to predict where each cut will take us. It might be a bit disconcerting, even confusing, but the experience pays off. Well, unless you are expecting a traditional performance documentary that captures each color guard team’s routine with static, all-encompassing wide shots — because Contemporary Color is certainly not that kind of film.